Following her scene-stealing appearance in Batman v Superman, Wonder Woman finally gets her own movie. Yes, she brought the Junkie XL theme with her, the whole thing revolves around the silly Dawn of Justice, and there’s an obscene amount of speed-ramping, but bear with it, because Wonder Woman is actually, refreshingly, breathtakingly good. With a few additions, this origin tale tells the story of Wonder Woman as the comic book literate would recognise it: moulded from clay and raised as an Amazon warrior on the all-female island of Themyscira, Diana – daughter of Queen Hippolyta and King of the Gods Zeus – travels to the world of mortals when she rescues downed American pilot Steve Trevor from a watery grave. As he informs Diana of the war unfolding outside, the Princess cannot resist the call to arms, fearing a resurgent God of War Ares responsible. There’s no moping or refusing the call here: Wonder Woman is the most proactive, openly heroic superhero since Captain America in The First Avenger. And, as a result, Wonder Woman is the most sincere superhero movie since Captain America: The First Avenger. At a time when Superman is an angry, dead man-child and Batman a murderous sadist man-child, it’s a relief to see a DC superhero act like one. There’s nothing to deconstruct, because we haven’t seen a live action Wonder Woman since Lynda Carter, and never on the big screen. Director Patty Jenkins gets the character and, more importantly, her audience. There’s a joy to Diana learning her craft and realising the strength of her powers, traded in for sheer awe once she takes to the battlefield, and strong, calm confidence from Diana herself. The film takes its time (occasionally tediously so) getting to the first big set piece, but Wonder Woman on No Man’s Land is instantly iconic cinema, both rousing and empowering. Tanks are flipped, men are kicked through walls, buildings are demolished and, most importantly, lives are saved. Here, Gal Gadot proves that she’s more than just a Junkie XL theme and a blank slate for Bruce and Clark to riff over. While the actress stumbles a little during the more dramatic sequences, her charisma shines through, particularly in London’s fish-out-of-water sequences or any moment shared with Chris Pine’s charming Captain Trevor. She’s actually allowed to smile too, which would have done wonders for poor Henry Cavill. She’s wonderfully supported by Pine, the most underrated of the big movie Chrises, and the pair have good chemistry. That’s more than can be said for her and the film’s somewhat perfunctory villains (Danny Huston and Elena Anaya), who work well together, but seem mostly bemused by Wonder Woman herself. Still, you can always count on Huston for some good ham, and he and Anaya make a great sandwich of it, with David Thewlis, Ewen Bremner and Lucy Davis (who steals every scene herself as Etta Candy) filling other small but vital roles beneath Gadot and Pine. This is still a DC Cinematic Universe joint, and as such, it does have its crossover flaws. While the movie is brightly lit and gorgeous during its Themyscira opening, everything after that is gloomy, grey and mildly ugly (thematically appropriate, with the war and all). There’s an overreliance on slow motion and the speed ramping effects, and the CGI is surprisingly bad. Its final battle, too, is unnecessary, almost indistinguishable from the Doomsday fight at the end of Batman v Superman. But the good far outweighs the bad, and these quibbles are easily ignored in the face of the movie’s importance. Wonder Woman is the best DC superhero movie since The Dark Knight and, if it weren’t for Logan, could well have been the best comic book movie of 2017. Optimistic, sincere and empowering, it’s precisely the movie this DC Universe needed. It’s the movie our own universe needs, too. And it’s about time. 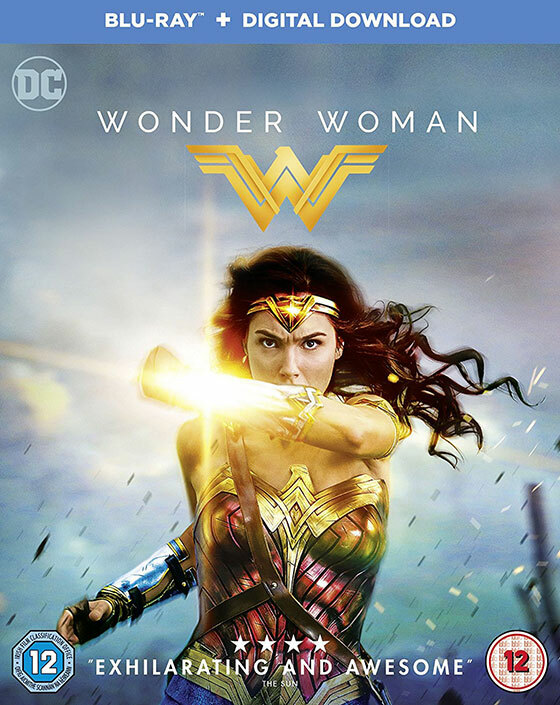 Wonder Woman is available on 4K UHD, Blu-ray, Blu-ray 3D, Blu-ray Digibook, DVD and Digital HD on October 9th.